Screw The Artist. A far more adventurous evening of appropriation occurred on Saturday night when Gardens & Villa played a soundtrack they produced as a commission from the Santa Barbara International Film Fest for F.W. Murnau’s Faust live at the Lobero. A fairly full house came to see the local boys, who once comprised a psychedelic band straight outta Westmont College, but now are firmly reincarnated in this more nouveau New Wave outfit that celebrated last year with a great self-entitled CD released on the prestigious indie label Secretly Canadian and toured extensively opening for teen heartthrobs Foster the People, before coming home and presumably immersing themselves in German Expressionist masterpieces. The results were lustrous from the beginning, which started with a note of horror film eeriness, a series of faint long notes and wind effects which preceded the film’s fantastic opening, a wagering session between a massive Mephistopheles and a light-blinding archangel over earth as gang turf, with hoary Faust — who at first looks like God himself to us — as the bet’s playing-ground. Then, in accumulating measures, organs, synthesizer, guitars, and drum machines (occasionally voice, flute and effects) filled in the score that fluctuated from slow and creepy to almost pop. From the beginning, the Gardens & Villa orchestration veered more toward the trippy grandeurs of the plot — the band being conceived up at Westmont College might have had something to do with this — rather than the syrupy melodrama that past pop band film scorers like Clubfoot Orchestra used to pull off. What’s even better is that G&V managed to use electronic music without sounding anachronistic. They were neither patronizing to the film’s heaviness, nor were they bending it to some postmodern game. Once in a while when sound effects, like a crumpling piece of paper, seemed in order, or a heartbeat beat helped signal a life in the balance, they hewed directly to the action, but mostly it was a complement, a musical understanding of the emotional content of the 1926 film. 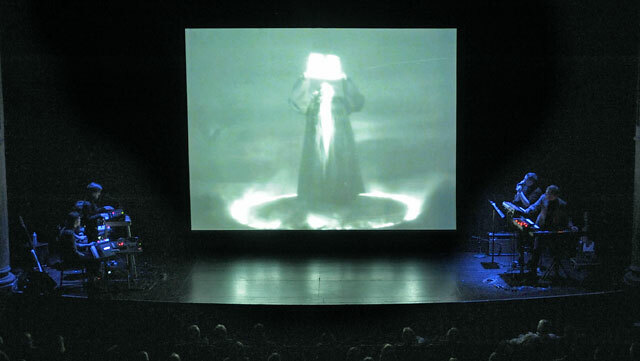 The show was scheduled to have an intermission according to Michael Albright, the fest’s brave new programmer, who introduced the evening, and it might have been better with a five-minute fresh air break somewhere around the point when Gretchen begins to fall for Faust and Mephistopheles’ cheap romantic tricks. But G&V powered through, which made its feat more dramatic: beats in time with a masterfully rich film, playing the hell out of a tale of medieval earth’s salvation.